Q. What Is Microdermabrasion ? Microderm abrasion is a skin resurfacing treatment that works by gently abrading the top layer of the skin with the help of micro aluminium oxide crystals or diamond tipped wand, leaving a new, fresh layer underneath. It is a non-invasive, non-surgical cosmetic procedure which can be performed at home, in beauty salons, spas and medical or dermatological offices. Q. Am I a Ideal candidate for Microdermabrasion ? Unable to take time out of their schedule to recover from more powerful resurfacing procedures (such as chemical peels, laser resurfacing, and dermabrasion). The above is only a partial list of the criteria that your surgeon will consider in determining whether or not this procedure is appropriate for you. 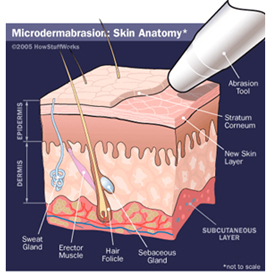 Be sure to ask your surgeon if he / she considers you an ideal candidate for microdermabrasion. Q. How Microdermabrasion Works ? Microdermabrasion uses a powerful device to spray microcrystals of aluminum dioxide (corundum powder) across the skin's surface. The aluminum dioxide is a very fine, very hard, sand-like material that blasts away the uppermost layer of dead skin cells on the skin's epidermis. A course of 4 - 10 sessions at regular intervals of 10 - 14 days is recommended depending on the condition being treated and treatments typically last 45 minutes. To obtain optimum results, this treatment may also be used in conjunction with other treatments such as Priori skin peels and Omnilux red & plus light therapy or just as a quick pick-me-up for tired, dull skins. Q. What can I expect afterward ? The speed of the procedure and its recovery time has earned it the name "the lunchtime peel." It can easily be fit into an hour-long lunch break. Immediately after the procedure, women can apply makeup and return to their normal activities. The skin will turn pink immediately afterward, but this color will fade within a few hours. The results of this treatment are often subtle improvements in texture and the appearance of refreshed-looking skin. Depending on the severity of the problem, the procedure may be repeated to achieve more dramatic results, and create smoother, younger-looking skin. Microabrasion has virtually no risks and no side effects because it is one of the least invasive skin resurfacing procedures. Contraindications, however, do exist. Patients on Accutane for 6 months previously, pregnant and nursing women, people suffering from active herpes lesions, malignant tumors, keratosis, active rosacea or weeping acne should not have microbrasion. Q. Is Microdermabrasion Good For Acne ? According to some dermatological studies, microdermabration is effective on mild acne. On the other hand, acne-prone skin gets easily irritated and may be too sensitive to micro-crystals. Microdermabrasion can, however, get rid of superficial acne scars and red marks. Nonsurgical, safe, effective "lunch hour" procedure. There are no side-effects to this treatment (which takes about 45 minutes) and no recovery time is required. Mild redness may occur for between 30 minutes and half a day after the procedure, depending on the aggressiveness of the treatment. We are delighted with this treatment. It is a perfect complement to our Photofacial treatments which uses pulsed light to treat more serious scarring and pigmentation problems to create a really beautiful complexion. The treatment is also complementary to our skin peels. It is already proving extremely popular with our existing clients and is set to become a 'must' for special occasions. Q. How long do the results last ? After the first treatment the skin will have a fresh, radiant glow. Improvement will continue throughout the treatment programme and generally fine lines, wrinkles and age spots become greatly diminished and many patients report that their skin seems to be softer, smoother and younger looking. Results can be maintained with the correct use of professional homecare products such as Priori Coffeeberry, Advanced AHA or Idebenone skin care ranges and regular maintenance micro skin resurfacing every 4 - 6 weeks. Q. What are the benefits of Microdermabrasion over other procedures ? Microdermabrasion takes less time to do, there is little discomfort and recovery time is relatively quick with no disruption to normal activities. Microdermabrasion is suitable for all skin types. It is a Chemical free treatment.